Spring break can be a fun opportunity for college students to escape the stress of classes and schoolwork, but it can also get out of hand easily. If you consume too much alcohol during spring break and get behind the wheel of a car, there’s a good chance you will end up with a DUI charge. 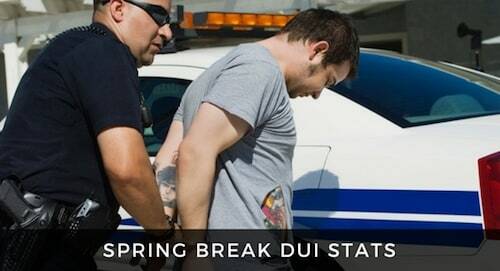 In the Nashville, TN area, spring break is not the time of the year with the most DUI arrests. According to the Nashville Police Department’s DUI unit, more DUI arrests occur in October than in any other month. The two months that follow most closely are March and May, the former of which is the month in which almost all U.S. colleges take their spring breaks. While spring break does not drive up DUI arrests to their yearly maximum, it does likely contribute to March being the month with the second-highest number of DUI incidents in Nashville. A 2015 study also found that traffic fatalities in popular spring break destinations rose by 9.1 percent over the spring break season, although the study did not focus exclusively on DUI-related incidents. Needless to say, the best way to handle a DUI is to proactively avoid putting yourself in such a situation. Even if you need to spend money on a cab after a night of drinking, know that the cost will be far lower than the potential costs of drinking and driving. If you do end up being pulled over for a DUI, your most important step is to retain an attorney as quickly as possible. Any evidence that works against you will be carefully recorded by the arresting officer for presentation in court. Supporting evidence that concludes you were not guilty of driving under the influence, however, will not be as clearly represented in a police report. For this reason, it is crucial that you choose an attorney and let him or her begin collecting evidence to support your case in court. If you have been arrested for a DUI in Nashville, TN, and want to retain the services of the city’s best DUI attorney, contact The Law Office of Bernie McEvoy for your free consultation. Bernie will put his years of experience as a criminal defense attorney to work for you, and he will fight to defend you against all charges related to your DUI arrest.